This entry was posted in Stringing Machines, Uncategorized and tagged portable stringer, portable stringing machine, Pro Stringer review, Pro-Stringer, Worlds smallest stringing machine by GGTennis. Bookmark the permalink. Recently we had the opportunity to review one of the more interesting/innovative products we have seen–the Pro-Stringer. 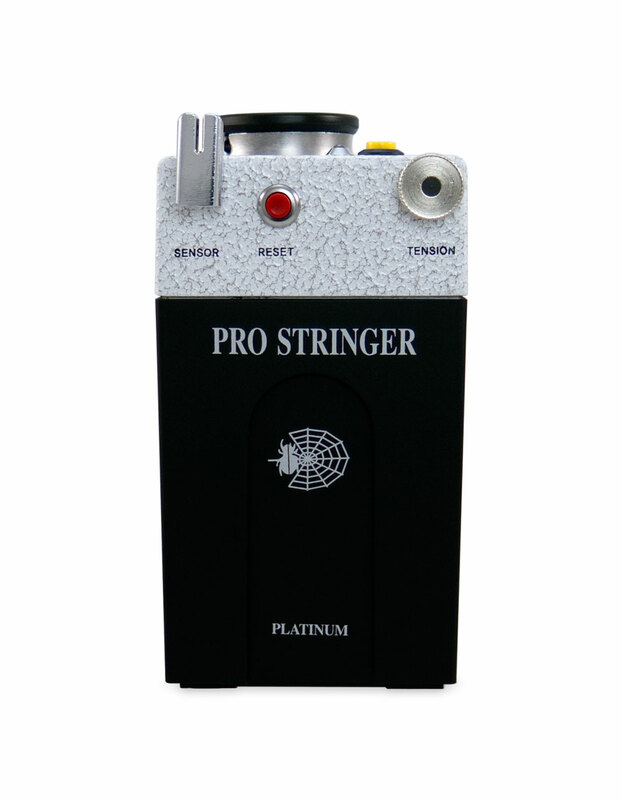 For those who do not know of it yet, the Pro Stringer is the world’s smallest stringing machine. The machine was originally conceived by a tour level player who wanted to be able to string for himself in order to save on the high stringing costs he found on tour. He desired a machine that was completely portable and would produce a string job as good or better than he could get using the tour stringing facilities. As self-proclaimed stringing snobs, we were admittedly skeptical about the type of results we could generate from something that appears to be nothing more than a “hobby-level machine.” However, we pride ourselves on being open-minded and went into our testing with the goal of keeping our skepticism at bay until we had a chance to experience the Pro-Stringer for ourselves. Given the size of the machine and some not so complimentary comments we came across through a Google search, we were less than optimistic. The next step was to mount our guinea pig frame, a demo unit from our store, a Donnay Formula 100. The mounting is two point at 12 and 6. The posts were threaded and we thought there was potential to possibly mark the frame so we decided to wrap a little lead tape around the part of the post that would come in contact with the frame. We were careful with our mounting and with this extra precautionary step we experienced no issues at all in regard to cosmetic damage. Now on to the fun stuff. Because we had read comments questioning the accuracy of the unit, our first order of business was to check it out for ourselves. We set up our tension calibrator and proceeded to test the unit. We connected the calibrator to the unit with kevlar string to avoid any stretching issues and pulled at different angles through the frame multiple times. At each tension, the unit was spot on. How could this be? We had seen a YouTube demonstration where the tension was all over the place. Perhaps that unit had an issue? Perhaps it was not the new platinum version? All we know is that whatever tension we dialed up, the machine delivered. One huge concern addressed, now onto stringing. We strung our Donnay Formula with a combination of MSV Focus Hex Soft in the mains with WeissCANNON New Element 500 in the crosses. This poly/syn hybrid is one that is popular with our customers and one that tends to do well in our demo frames. We normally string with flying clamps because we believe they provide the best string job especially when we string using the JET Method. Usually we clamp on the bottom of the stringbed. With limited space between the rotational bar and the frame we had to use the clamps on top of the racquet instead of underneath so this was one adjustment we had to make. The clamps that come with the unit are functional. There are two sizes and they are adjustable. We used them for the majority of the string job, but by about 1/2 way through the crosses we were longing for our beloved Stringway flying clamps so we switched out just to see how the Pro-Stringer felt with our familiar clamps. Installing the mains was a pleasant experience. We were super interested in the tensioning unit. By setting the unit directly against the frame there was no long stretch of string essentially getting pulled twice. We like this. In fact, we like this A LOT!!! We also were watching for frame distortion and with the tensioner directly against the frame we were not finding the distortion we expected. We measured the frame when we first put it on and again when finished. No distortion. Another win for the Pro-Stringer. The tension adjustment on the unit is small and not so easy to read. Because we make use of different tensions when pulling our mains, getting this set correctly slowed us down a little, but it is something we could definitely live with if stringing on the road. It would be cool if a future version of this machine could have some form of digital tension display and method for setting. Now we were ready for the cross strings. We were concerned with the limited distance between the stringbed and the rotational racquet bar that we would have problems with weaving the crosses. After the first few weaves we found a very nice rhythm. The rotational racquet bar is not very wide and with our weaving technique we tend to weave in a “V” pattern and pull the string at the half way point. This worked nicely for the majority of the crosses. Once we got close to the bottom of the frame we were working in tight space and the rotational bar did end up slowing us down a little at this point. It was something that whoever uses the machine will probably get used to and it should be easily overcome. We thought this challenge would be a showstopper and were surprised how little it impeded our stringing process. When we removed the racquet from the machine we measured the tension several ways. The RDC reading was 42. We were expecting 44, but the reading was close to what we expected and given time to get used to the stringing process with the Pro-Stringer we believe we would be able to get to our desired results. The center 14 mains were all within 2-3 pounds of each other as measured with the Stringmeter and the crosses were also consistent. We plan to do additional testing in the coming weeks to see just how close we can come to replicating the results we get with our Baiardo and Stringway machines. Our conclusion is that the Pro-Stringer is a serious machine. It definitely does not fall under the category of “hobby-level”. No hobby level machine we have tested has come close to giving us our desired outcomes. The Pro-Stringer impressed us and made us want to delve deeper to see what it can do once we become more fluid and used to using it. Given the huge advantage this machine has over anything in the marketplace in terms of portability and the small amount of space needed for storage, we believe the future is indeed very bright. At minimum, two doubles. I would suggest 1 double and 1 triple if you want to invest a little more. Ideally I use 1 double and 2 triples when stringing, but this is not necessary, just a luxury. Thank you, I will try that. So you use the second triple to clamp the pulled string; before releasing the previously clamped string? I like that idea, if that is in fact how you use it. Maybe the reason the YouTube test of the unit’s calibration was due to the fact they used a luggage scale to measure the pro-stringer’s accuracy. Just a thought! You realize that luggage scales are no different then other scales right? As long as it pulls to a calibrated number they are the same. The gamma one sold at TW is just a luggage scale in a gamma casing. Either way the luggage scale showed perfect numbers from a drop-weight at multiple tensions, yet the Pro Stringer was all over the map. If you watch the video you even see that the Pro Stringer was not even repeatable, yet the drop weight was. Looks like a bad unit perhaps, but not the luggage scale’s fault. Kevin is right, why there is no other video, that someone test it? The other wired it the price of the unit too. it was like 600-700 first, next 860 and digital 1400….that’s joke right ? The pro stringer is used by many players very successfully on tour. It’s a serious stringing machine.